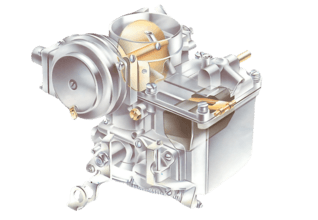 The carburettor is often suspected of causing an engine to run roughly, when the real source of the trouble may be something quite different. Parts to check before engine tuning Any hoses on theinlet manifoldmust be secureand in goodcondition. Inspect the choke andthrottle cables and rodsfor free movement andcomplete return. Check the boltsconnecting theexhaust downpipeto the manifold fortightness. Check the exhaustmanifold bolts fortightness. Check the carburettor mountingnuts or bolts for tightness. Look for leaks inthe fuel pump andpipelines. So before you start any work on the carburettor, check every other part of the engine. If the trouble cannot be traced, try tuning, or adjusting, the carburettor. The age of the vehicle also makes a difference. 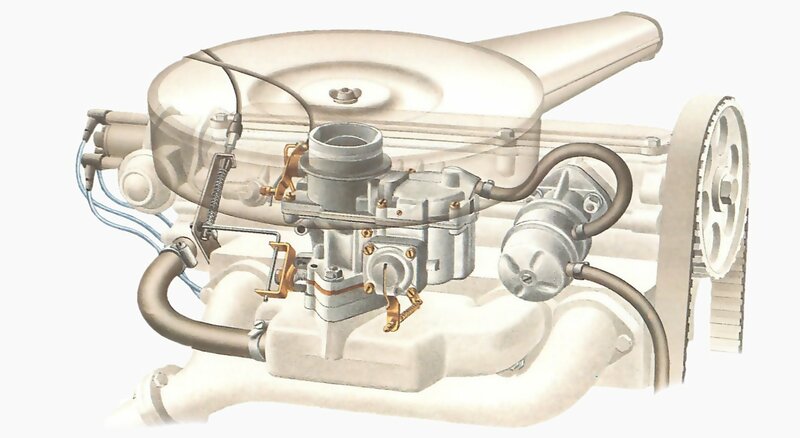 Up to the early 1970s, most carburettors could be easily adjusted for mixture strength, as well as idling speed. The mixture was checked at every major service. Since then, laws limiting exhaust pollution have caused manufacturers to produce much more complex carburettors. They are calibrated carefully, then made 'tamper-proof. 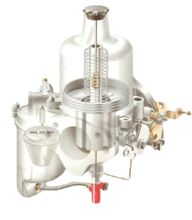 These sealed carburettors stay in tune much longer (See Adjusting an emission-control carburettor). However, check that the cables or rods that work the choke and throttle are not loose or jamming, and that the air filter is secure and unblocked (See Air filter change). Air leaks on the inlet side of the engine upset the fuel mixture. Check that the inlet-manifold nuts and carburettor mounting bolts are tight. An intake leak usually causes a high-pitched whistling noise, which may vanish as the engine speeds up. See that the hoses from the inlet manifold — such as those going to the breather system or a brake servo — are firm and free from splits, cuts or abrasions, and that the hose clips are tight and in the right place. Check also that the nuts on the exhaust manifold and downpipe are tight (See Exhaust manifold gasket replacement). There is a chance that the tank may accidentally have been filled with fuel of too low an octane rating (such as two-star instead of four). This tends to show itself by a knocking sound 'pinking' — when accelerating. Fuel supply to the carburettor is also important. There is no point in tuning the carburettor until you have done any necessary maintenance on the supply system — check the fuel pump and fuel pipework (See Checking a mechanical fuel pump). Before you start, find where the adjustments are on your particular carburettor (See Preparing for carburettor adjustment). Some adjustments may have to be made uncomfortably close to a hot exhaust manifold. Practise on a cold engine to familiarise yourself with the adjustments. That also ensures that you have the right tools ready. Most adjustments need only a screwdriver; some require just fingers. Also check for spindle wear. Prepare for tuning by allowing the engine to idle until it reaches normal working temperature. If there is no gauge to tell you when the temperature is up to normal, drive for about 5 or 6 miles. Do not allow the temperature to rise above normal while you are tuning. That happens if the engine is allowed to idle for a long time. If you set the mixture with the temperature high, the mixture will be too weak. As soon as the car is driven and the temperature drops again the engine will misfire, run roughly and lose power. On down-draught fixed jet carburettors the spindle is at the base. A worn or loose spindle can cause the throttle butterfly plate not to seat properly. 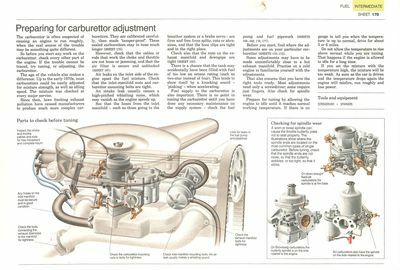 The illustrations show where the spindle ends are located on the most common types of single carburettor. Before tuning, check that the spindle ends are not loose, so that the butterfly wobbles, or too tight, so that it sticks. On Stromberg carburettors the butterfly spindle is on the side nearest the engine. 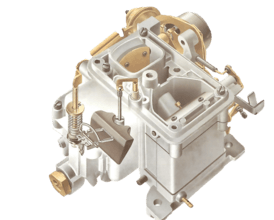 SU carburettors also have the spindle on the side nearest to the engine. Le fonctionnement du carburant avec un carburateur à jet fixe.